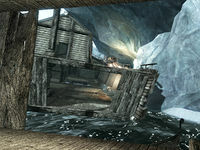 The Wreck of the Winter War is a shipwreck located east-southeast of Snow Veil Sanctum and far northeast of Windhelm. There is a small gang of bandits using it as a home base. 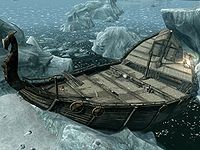 It is located along the southern shore from Windhelm heading northeast, past Yngol Barrow wedged between the frozen cliffs and an ice covered island, with its keel snapped and the ship broken completely in half. The easiest approach is from the west climbing the ice on the island to near the bow of the boat. Take care to avoid two bear traps on the ice and two bandits on this half of the deck. The bandits have used some of the broken planking to form ramps and bridges to link the two halves of the ship together at several points and on several levels. Any fighting with the two on deck will alert a third bandit to your presence. 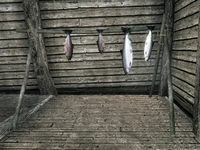 Just to your right as you enter the ship's cabin is a rack holding four salmon, including a giant one. The bandit chief is often found sleeping on an unowned bed roll inside the cabin one deck below, behind an unlocked wooden door. There is an unlocked leveled chest behind the door in the same cabin as the chief. On the same level as the chief, to the southwest of the stairs are two cages, neither are locked, but the first contains the corpse of a fisherman, while the second is empty. Further to the southwest are a couple of crates against the hull of the other half of the ship, reached by using more of the planking laid out by the bandits. On one of the crates is a copy of the Lockpicking skill book Surfeit of Thieves next to four lockpicks. Behind the crates is an expert-locked chest containing leveled loot. There are stairs leading down to the bottom deck which is partially flooded with mud filling part of the deck. The first half of the ship's bottom deck is almost completely flooded. There is a small row boat tied to the stairs at the bottom of the ship. In the water around the broken keel are several salmon and on both the inside and outside of the ship's hull are Nordic barnacle clusters. On the top deck to the port side of the ship is a cooking spit over a fire built directly onto the deck of the ship. There are two masts forward of the ship's cabin, both of which have been smashed, leaving stumps, hanging from the remnants is a garlic braid and a bunch of dried elves ear. An unmarked camp can be found to the northwest of the ship. Walk up the ramp on the front half of the ship and follow the ledge around the bend. You'll see an island to the northwest. Jump across the ice to get there with minimal swimming. To the right, you'll see the camp. On top of a crate next to the extinguished campfire, you'll find a fisherman's journal, which tells about two fishermen out of luck. You'll see a boat docked in the camp. Look directly ahead of it to find another boat capsized in the water. The water around it contains at least five slaughterfish. Using Flame Cloak or a similar spell will dispatch them easily. Directly beneath the overturned boat you'll find a knapsack, a medium coin purse and a random weapon. The skeletons of the two unfortunate fishermen, Skeggr and Advard, will slowly float to the surface and continue down the current, traveling northeast of the overturned boat. Both of these can be looted for small amounts of gold. 1170 feet to the northeast of the wreck lies an unmarked location with a skeleton, six gold ingots, a random enchanted leveled Dagger and the Pickpocket skill book Beggar all marked under a flag on a pole. (map). The water inside, around, and directly south of the shipwreck may not have the usual water overlay. You can see underwater as clearly as above water. This page was last modified on 31 December 2018, at 02:08.